Wasabi is an integral addition to many different kinds of sushi dishes. Its flavour adds a real zing to the overall taste experience, complimenting the other ingredients beautifully. But one of the questions often put to us by our sushi takeaway customers is why this popular paste is so hot. With them in mind, we’ve delved behind the science of this staple sushi delivery ingredient in an effort to explain why it induces such eye-watering enthusiasm. For sushi fans who are not in the know, Wasabi Japonica is a plant belonging to the Brassicaceae family, which also includes horseradish and cabbage. Traditionally used as a natural herb, the plant has become an extremely popular culinary condiment in oriental cuisine. 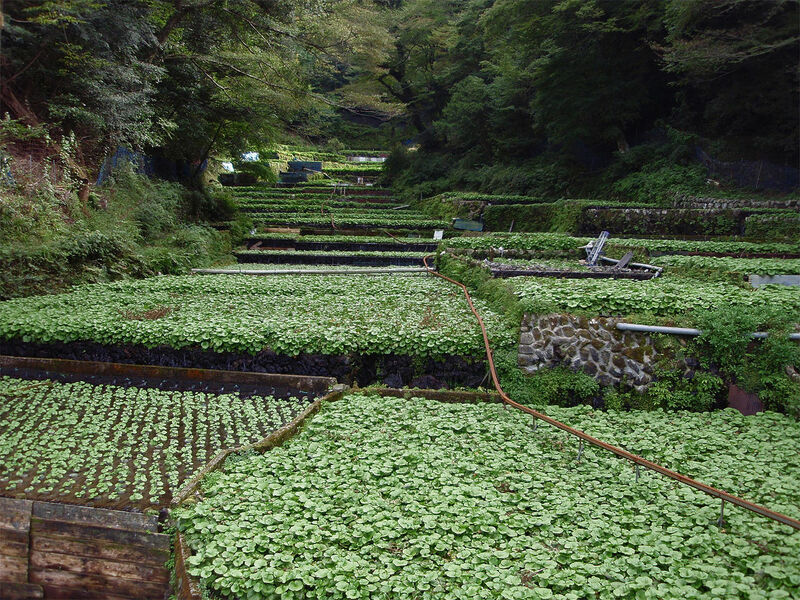 The Wasabi plant grows naturally alongside stream beds in the mountains of Japan and thrives in temperatures between 8°C (46°F) and 20 °C (70°F). 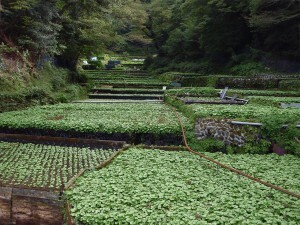 Most wasabi plants can be found in Iwate, Nagano, Shizuoka, Shimane although cultivation has become far more widespread. They can grow up to heights of 30 centimetres, while its leaves, which are dark green in colour, are around 15cm in length and breadth. In order for the plant to mature properly, the perfect balance of sunlight, climate and water quality must be present – the misty river-valleys of Japan offer the perfect climate for this. All parts of the wasabi plant are harvested including the stems, roots, leaves and rhizomes (flower). The latter stores the plant’s nutrients and is where the flavours are more concentrated. Wasabi is sold as a stem or as a ready-made paste – most good sushi takeaway establishments will purchase the stem which is then finely grated into a thick green paste. This is often achieved by either rubbing the root on sharkskin or by using a special grater. In order to retain its rather short-lived flavour, sushi chefs often place the wasabi between the fish and rice. Spicy foods often contain a compound known as Capsaicin, which is found in the seeds of the Capsicum plant. This natural irritant is present in all chilli peppers and is a natural defence mechanism that is actually supposed to discourage its consumption! Once ingested, it binds to the tongue’s TRPV1 pain receptors and causes a burning sensation – the extent of the burning depends on the concentration of Capsaicin molecules. So if you see a fellow diner staggering towards the nearest fire hose it’s probably safe to say that they’ve overdone it. Little do they know that water can make the sensation much worse! Wasabi is not hot in the strictest sense of the word as it doesn’t contain capsaicin. However, it does contain its own eye-watering compound, which is known as Allyl Isothiocyanate. AITC is also present in condiments such as mustard and is largely responsible for the pungent taste. Like capsaicin, it binds to the TPRV1 receptors on the tongue. The key difference is that while capsaicin causes its victims to register heat at much lower temperatures, AITC doesn’t actually cause a heat sensation. Instead, the compound triggers a reaction in the nasal passages which can make the eyes water profusely. In fact, Wasabi is widely used as a treatment for clogged sinuses. Because the odour is so powerful, it only takes a few short seconds of inhalation, before the scent causes the nasal passages to clear. In fact, every element of the Wasabi Plant can be used to promote health and well-being. The leaves and stem can be ground into antibacterial medicines which can help with the treatment of flu-like symptoms and respiratory problems. There is even some evidence which suggests that the plant can prevent the growth of human cancer cells found in the stomach lining. As you can see, Wasabi is not only an attention-grabber amongst sushi takeaway connoisseurs, but the plant also provides many health benefits. So if you’re in London and are looking for sushi which features Japan’s favourite condiment, why not drop us a line. All of our dishes are accompanied with Wasabe paste, which ensures that you can make the most out of the best sushi in London. For more information, please visit our main site.